Built by Nippon Jidosha Co, Ohmort in Tokyo the company first started manufacturing 3-wheelers under the name of “New Era” from 1928. These vehicles were a motorcycle front end with a truck type back end powered by a single cylinder engine and then changed for a V-twin in 1936. In 1937 the name was changed to Kurogane. During World War II production of 3-wheelers was halted in favor of a 4x4 military scout car though resumed again in 1949. 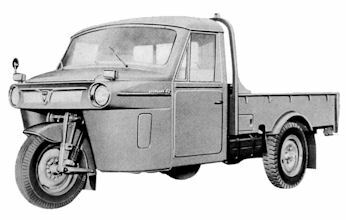 The new 1949 vehicle was now a 10 cwt 3-wheeled truck powered by a range of engines up to a 1.5 litre four-cylinder water cooled engine The range featured vehicles that were equipped with both handlebars (for the lighter vehicles) and steering wheels for the larger vehicles that featured a number of body styles. Production of the Kurogane ceased in 1962 when the firm went bankrupt.